"I was very well looked after and Tony was very efficient and helpful.I am delighted with my car. " Read our customers' honest and impartial Land Rover Discovery Sport car reviews and ratings to easily find your next car at Motorparks. It's a very good car, fuel consumption is not good - you will not get 53 mpg, more like 35 mpg. If you tow a caravan, get one - it's the nuts at towing. Smooth ride and very comfortable, would give 10/10 but for its fuel consumption. I am loving this car! So comfortable, quiet and well WOW. It has everything I will ever need and probably some stuff I will never find! Just had my 2nd 'handover' visit and am very pleased at the patience and professionalism of Grange Woodford. Very reassuring to an older techphobe! An exceptional SUV. Luxury combined with practicality. The advice and courtesy shown by Grange Landrover was superb, much the best I have encountered when buying a new car. Excellent and relevant specification level. Drives as well as it looks. Great economy in Eco mode but equally impressive performance in Sport mode. We love our new Discovery Sport. We have 3 teenage girls and they love it too - they have plenty of room in the back. It is a nice comfortable drive. After driving a BMW 5 series for 5 years, I thought that the Discovery Sport might be a bit less comfortable, but it's not. I had some concerns about the ride with 20in alloys, but it's at least as smooth as the BMW was, and also very quiet, apart from one annoying rattle coming from somewhere in the back when I accelerate I have not yet had a chance to locate it. Fuel economy is averaging approx. 40mpg so far, which I think is OK considering the weight of the car. The maps are currently a bit limited - it couldn't find my postcode, but it does give alerts on traffic conditions. With regard to Grange Land Rover, I was very pleased with the service I was given. Jenny has very good knowledge of the car's features and gave a very comprehensive introduction. I would not hesitate to recommend them. We've recently leased a Discovery Sport which is an absolute joy to drive. We are a family with 3 young children all of whom fit comfortably with their car seats in the rear seats. The car is extremely economical, safe, enjoyable and beautiful to enjoy. The Discovery Sport suits our needs and we are very pleased with it. We bought a Land Rover Discovery Sport SE Tech. Lovely car to drive and also be a passenger in. Extremely pleased with the car and the service we received from Grange. My new Discovery Sport is fantastic, it drives brilliantly as well as being such a comfortable place to be. On top of that, it looks great too. We are very happy with the beautiful Land Rover Discovery model which we bought. It's a dream to drive such a car and is the second one we have in our home! 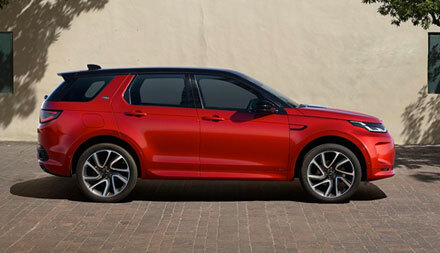 We really love Land Rover and the next one is going to be the same! An excellent and comfortable all round vehicle for family use. We can fit everything and everyone we need in the large amount of space available. The high up driving position gives great visibility and the engine has good power. The interior is comfortable and solidly built. The Land Rover Discovery Sport is a fantastic car! Very comfortable, lovely to drive and a really spacious boot. I loved my Range Rover Evoque but this is a far more practical family car. When my lease expires on this one, I will have no hesitation in getting another one. I have had many cars over the years from old minis through to Porches. I haven't owned a manual car for a while but the garage were happy to give me an overnight test drive which was great. As someone who has had both hips replaced I wanted to ensure its suitability. I am very pleased overall with the 'Disco' sport. Would I recommend it, absolutely. This is the second Land Rover Discovery Sport that I have had, it is perfect for the rough roads in the countryside where I live, but still has the feel of a solid, well built comfortable top end car. I took delivery of a Land Rover Discovery Sport HSE 180, manual in July and have been hugely impressed with the car. The car is a pleasure to drive and is quiet and refined. I'm getting about 43mpg on my regular commute over 50mpg with minimal traffic. iPhone connection and incontrol works well though for some reason not all albums show up - which is odd. Overall, I'm really pleased and Grange Welwyn were great.